Our clinic has one the best Intersegmental free table Massage in Ontario, which helps in relaxing the muscles and reducing the muscle spasms. Our free table massage promotes recovery and healing process from cervical, thoracic and lumbar injuries. 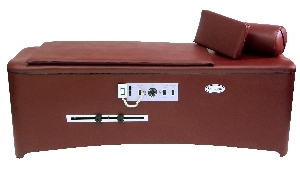 This table is very beneficial in providing relaxation and reducing stress of patient. You can also enjoy your favorite show as you are receiving your treatment. Free table massage helps blood flow and oxygen to discs, ligaments and muscles thus enhancing balance, mobility and strength. The patient can benefit from this table massage for reliving pain and stiffness from the area of neck, upper back,mid back and low back.This table can also work locally on the thoracic area to correct the posture. This table massage is good for body of all sizes, shapes, and weights. Enjoy our complimentary 15 minute free table massage, while being introduced to our other great services such as laser, HydraFacial, massage and physical therapy. Our table massage is the most famous equipment among our patients.There is minimal side effects to receive this treatment. Our clinic might required a doctor note for this treatment in case of sever disc. This table has soothing and relaxing effect on the body.It provides relaxation massage while you are dressed and resting on the table.